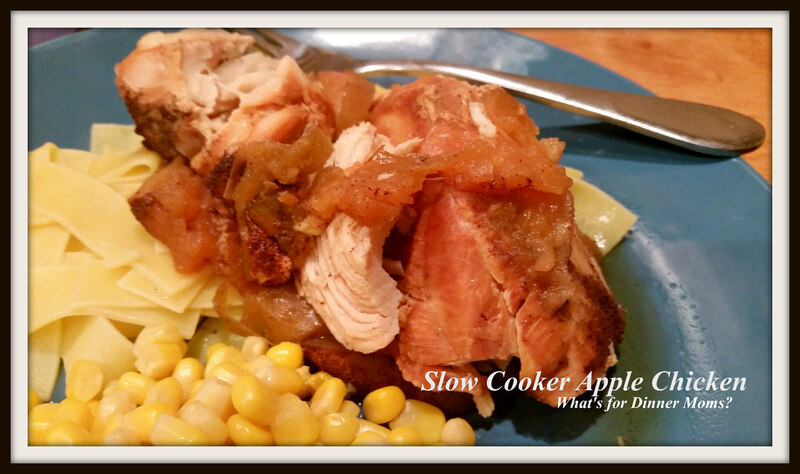 Slow Cooker Simple Apple Chicken – What's for Dinner Moms? Yesterday I did not post anything on my blog which is unusual for me. Something had to give and yesterday it was my blog. Everything is good but the day can only hold so many things. When I looked back over the last 11 weeks I realized I had only missed posting 6 days. Not bad. So, this was our Wednesday night dinner. Now that I have resigned myself to the fact that it really is fall I am jumping into all the things we love about it. The apple cider, the donuts, the sweatshirts and walks where you scuff your feet in the fallen leaves. I really wanted to make a fall dinner with apples and pork. The pork was in the basement freezer. Did I REALLY want to go all the basement and dig through the freezer to find a pork roast or chops? No. So I opened the upstairs freezer and found chicken. Chicken. Pork is the “other” white meat so why not try it? I wish I could add smell to my page. It was heavenly. The apples, cinnamon and honey were delicious with the chicken. My son loved it all. My daughter wasn’t thrilled by the apples but she loved the chicken and both asked me to make it again soon. It was so simple of course I agreed! The chicken even had a delicious apple taste to it from the apples cooking right on top of the chicken. I served this with fresh apple cider which really brought the meal together. I served the chicken over Amish egg noodles with corn and a green salad on the side. Place chicken in bottom of slow cooker. Place apple slices over the top of the chicken. Sprinkle cinnamon over top of apples and then drizzle with honey. Cover and cook on low for 6 hours. Longer than 6 hours and your chicken will start to shred. It is up to you but my family prefers the breast still together. I wish you could add smell to your page too. 🙂 And incredible that you’ve missed so few postings. Good for you!! Thank you! The smell of apples, cinnamon, and honey made it smell like fall in the house. I will need to you to come to my office and wipe the drool off of my desk please!!!!! Sounds divine! I can already taste… the cinnamon, honey and the apples. I have archived your recipes. Now to transfer them to my folder of recipes …. I have to write them down . * sigh * You have the most unintimidating recipes ever, with simple ingredients I can find in our pantry. Like, I don’t have to climb seven mountains to get that special ingredient. That’s what it feels like with some recipes. Thanks ! Thank you! That is exactly what I am trying to do. I just want to inspire you to try different things and make them your own. Add more cinnamon, leave out the onions, whatever to make it easier and taste good for you and your family! By the way if you are on Punters all my recipes are there at What’s for Dinner Moms? archived under recipes I have tried. Pinterst, spell check didn’t like that! Sounds really good, I want to smell it too. I did make pork with onion and apple, but this sounds much better. Thanks. It was so simple! I’m going to try this ! I like apples ! Always looking for something different ! I hope you like it. My kids loved how the chicken tasted like apples. If you like pork and apples we liked this a such if not a little more. My daughter didn’t like the texture of the apples but loved the chicken. Sometimes simple is the way to go!